Printex is a customer-driven and service-oriented company serving a broad spectrum of American and international industries for over 25 years. We continuously strive to improve our products and services. Our goal is to provide you with effective pad printing solutions with our state-of-the-art equipment and the highest quality of consumables, which include pad printing inks, silicone rubber print pads, steel and photopolymer plates and our 25 years of experience. Printex incorporates intelligent design with quality manufacturing to make our line of G2 equipment a leader in our industry. Always mindful of our customers changing demands, the built-in modular features of our G2 equipment affords our customers both flexibility and expandability to meet or exceed their pad printing requirements. 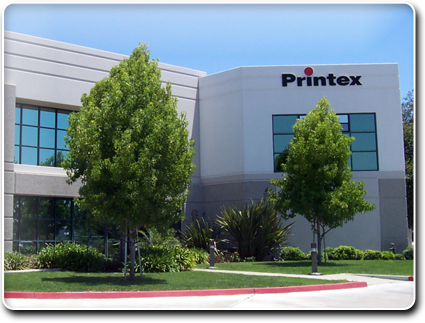 Printex’s manufacturing facility and head quarters is located in Poway, California, which is about 20 miles north east of San Diego. To provide the customer with innovative, high quality, cost effective pad printing products and solutions, and to deliver them with the best service and follow through that this industry has to offer. We only succeed when you succeed. Our experienced mechanical and electronics engineers, applications technicians and machinists all work closely together to build a better machine and to ensure that the machine that you buy from us will exceed your expectations. Our applications technicians qualify machines and tooling prior to shipment, conduct training sessions for your personnel and conduct on-site customer service and technical support. Our graphics department offers art work generation and state-of-the-art cliché processing services which includes photopolymer, steel and direct-to-plate laser-imaged plates to give you the highest quality images possible. Our highly skilled ink department can blend virtually any color including but not limited to the Pantone Matching System to meet your strictest requirements. Our state-of-the-art contract printing department (best in the country) can tackle any pad printing job: from long runs to short runs, from simple to extremely difficult. We also use this department as a proving ground in our product development process. Our dedicated sales and customer support team is committed to meeting every customers needs. Their task is to recommend the right products, take your orders, ensure that your order is shipped accurately and on time and keep you informed of new products and processes including technical updates. We will work hard to keep your business.